When it comes to cleaning your carpet, you probably know about vacuuming and professional steam cleaning. Both are effective at cleaning your carpet, removing stains and leaving it smelling fresh. While you may vacuum your carpet several times a week, the steam cleaning is probably only done once every few months or even on an annual basis. It’s a good idea to know how to clean up little problems in between professional visits to keep the carpet looking great. Here are some home remedies you can use that are surprisingly effective at cleaning your carpet. Put baking soda in a shaker and sprinkle it over the carpet. If you want a fresh smell that lingers in the air, add an equal amount of baby powder to the soda. Once the solution is scattered across the carpet, us a soft broom to gently work it into the carpet and allow it to sit. 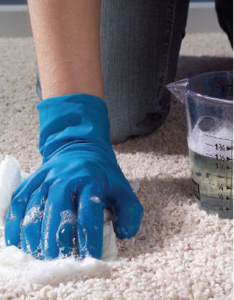 The baking soda will absorb grease and stains to leave your carpet looking cleaner. The solution neutralizes odors to leave it smelling fresh and clean. Leave it in the carpet anywhere from 30 minutes to 24 hours before vacuuming it away along with stains and odors. If you have an area that smells particularly bad, you can boost the cleaning power of baking soda. Put a generous application of soda on the carpet and cover the area with plastic. Use books or furniture around the edges of the plastic sheet to hold it in place. Allow it to sit for a day before removing it and vacuuming up the residual powder. The stain and odor should leave the carpet along with the baking soda and baby powder. Mix two-tablespoons of dish detergent in a bowl with an equal amount of water. Use a hand blender to whip the detergent into a foamy cleaner that’s safe for most upholstery and carpets. Gently work this foam into stains. Rinse it clean with fresh water to remove stains and odors. This cleaning solution is practical for pet stains, party accidents, and even mud that has been tracked in through the patio door. Vacuum the carpet afterwards to pick up any residual dirt and leave it looking incredible. The standby of dog trainers everywhere, vinegar is known for neutralizing odors from pets. After blotting a pet stain, pour a small amount of vinegar over the remaining stain and blot it up with clean towels. If you have a steam cleaner, you can also add a little vinegar to your rinse water to boost the cleaning power and ensure that your carpets are clean. With these easy and affordable home carpet cleaners, you can keep your carpets looking incredible in between professional carpet cleanings. Keep these items in your home pantry so they will be ready for use after an accident or if your carpet starts to smell. If it’s time to have the carpets cleaned professionally, contact us at High Quality Carpet to see how we can clean your carpets to make them look and smell fresh.